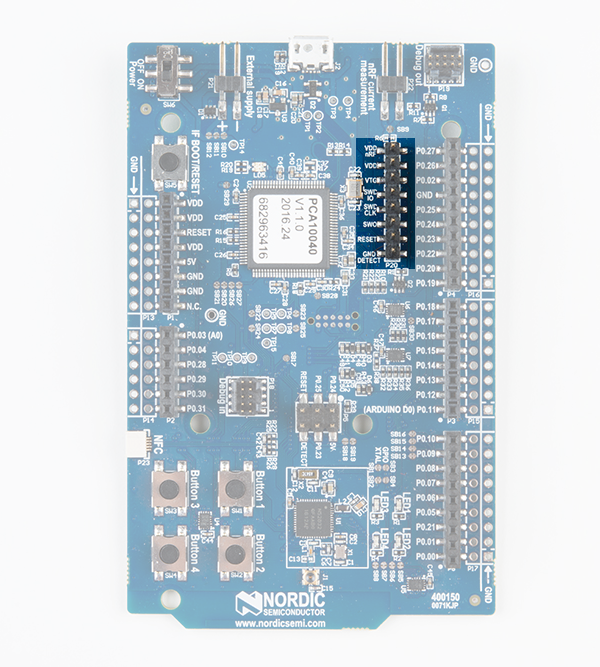 The nRF52832 is Nordic Semiconductor's latest multiprotocol radio system-on-chip (SoC). It's half microcontroller, with a list of features including 32 configurable I/O pins, SPI, I2C, UART, PWM, ADC's, 512kB flash, and 64kB RAM. And, it's half 2.4GHz multiprotocol radio, supporting Bluetooth low energy (BLE), ANT, and Nordic's proprietary 2.4GHz ultra low-power wireless communication -- it even features on-chip NFC tag support. 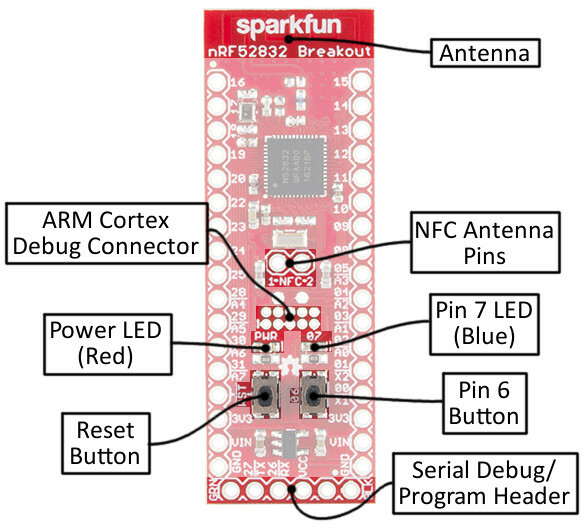 SparkFun's nRF52832 Breakout provides easy access to all of the chip's features. It breaks out all of the nRF52's I/O pins, provides a 32.768kHz RTC crystal, a user-programmable button and LED, and a trace antenna to send and receive those 2.4GHz transmissions. Plus, to make the chip as easy-to-flash as possible, the breakout comes pre-programmed with a serial bootloader. 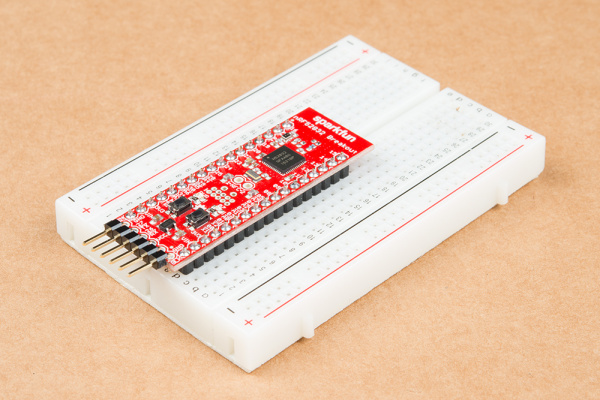 This tutorial is a comprehensive getting started guide for the SparkFun nRF52832 Breakout. It documents hardware features of the board, and includes tips on getting a computer set up for nRF52832 software development. Programming the chip via the serial bootloader using the Arduino IDE is the primary focus of the latter half of the tutorial. To follow along with this tutorial -- and to get your nRF52832 Breakout up-and-running -- you'll need a few additional components. 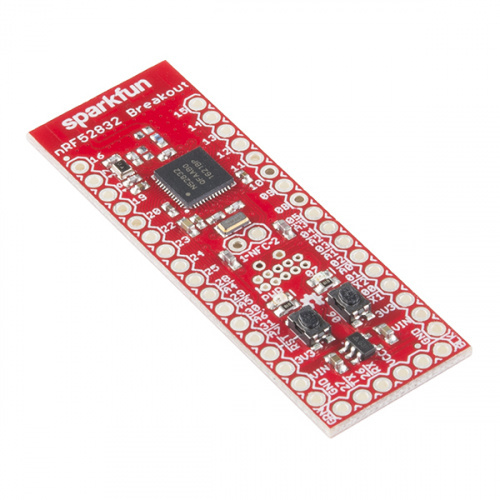 To program the board, we recommend interfacing the breakout board with a SparkFun Beefy 3 - FTDI Basic Breakout. In addition to providing a USB-to-serial programming interface, this board will also be able to fully-power the nRF52832 breakout. The less-beefy 3.3V FTDI Basic can also be used to program the board, but we recommend finding an alternative power supply to power the nRF52832 board. Whichever USB-to-serial converter you go with, don't forget the USB cable! To interface the nRF52832 Breakout with the FTDI, you'll need to solder a 6-pin strip of headers to the board's serial interface. We recommend right-angle headers for this job, but the straight or long headers can also get it done. Grab some extra male headers -- or even female headers -- if you plan on connecting to any of the I/O pins. Finally, to complete the Bluetooth connection, you'll need a BLE-equipped smartphone. 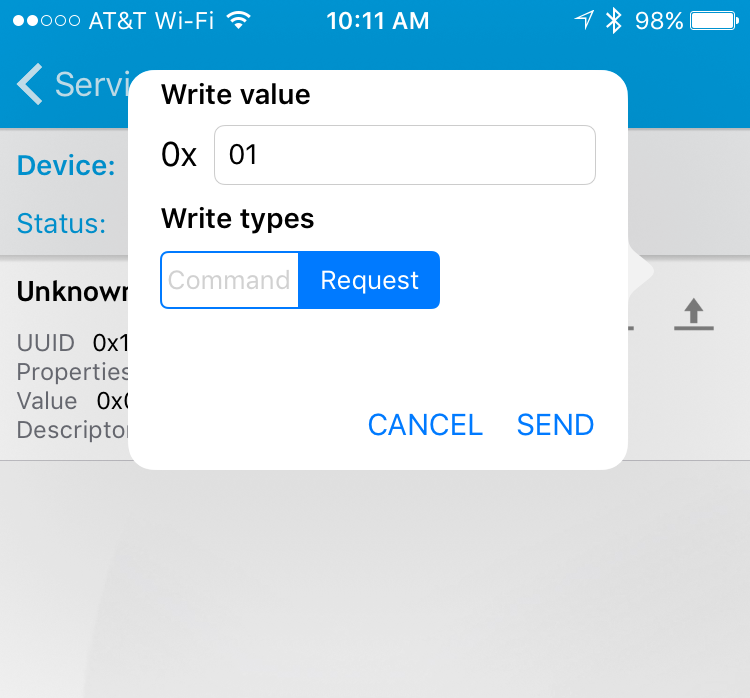 This tutorial documents how to use the nRF52832 with Nordic's free, open-source nRF Toolbox and nRF Connect apps, which are available on both iOS and Android devices. The nRF52832 can operate on a power supply between 1.7 and 3.6V. The board also includes a 3.3V regulator with a maximum input of 6V, in case you want to power the board with batteries or a regulated wall supply. The power input pins are located toward the bottom side of the board. Each of the header rows includes a "GND", "VIN" and "3.3V" supply input. The "VCC" and "GND" pins on the 6-pin serial header can also be used to power the board (assuming the jumper is closed, more on that later). The VIN pin feeds into the on-board regulator, which brings the voltage down to 3.3V to supply the nRF52832. The regulator can supply up to 600mA -- way more than the nRF52832 should ever need. If you're powering via regulator, you can use the 3.3V pins as outputs to supply external components. Note that the maximum input to the 3.3V regulator (into the VIN pin) is 6V! Alternatively, you can skip the regulator and supply the nRF52832 directly by using the 3.3V pin. Voltage supplied here doesn't necessarily have to be 3.3V -- it can be anywhere between the SoC's 1.7V and 3.6V operating range -- so you can use a coin cell battery, or a pair of alkaline batteries to power the chip. The red power LED is tied to that "3.3V" bus as well. If it's lighting up, your nRF52832 should be getting power. The nrF52832's microprocessor features an array of hardware peripherals, including three SPI -- configurable as either master or slave, two I2C interfaces, and a UART (with optional flow control). On top of the serial interfaces, the chip also features 8 ADC pins and three hardware PWM outputs. Each of the 32 I/O pins can be assigned almost any function, so you can move those interfaces around the board as you see fit. For your real-time counting (RTC) needs, a 32.768kHz crystal is connected to pins 0 and 1. Pin 6 is connected to a momentary push-button, which serves an important function during bootloading. Pin 7 is tied to an LED. It's active-low, so pull the pin to ground to turn the LED on. Pins 26 and 27 were chosen as the RX and TX UART pins. They can be re-assigned in a user-application but are stuck as the serial pins during the bootloader's operation. Pin 21 also doubles as an active-low reset input. The nRF52832's NFC capability can be supported by an antenna connected to pins 9 and 10. The back side of the nRF52832 Breakout is filled with jumpers to help you customize the operation of your board. They're labeled with an abbreviation of their purpose. The jumpers that default closed can be sliced open with a hobby knife, while those jumpers that default open can be closed with a small application of solder. 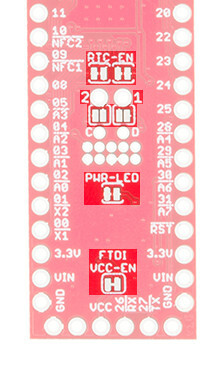 FTDI VCC-EN Closed Connects 6-pin serial header VCC to 3.3V bus. PWR-LED Closed Enables or disables the red power indicator LED. 1/2 (NFC) Open Connects GPIO 9 and 10 to NFC antenna tuning capacitors. RTC-EN Closed Connects GPIO 0 and 1 to a 32.768kHz RTC crystal. This jumper controls whether or not an FTDI Breakout connected via the 6-pin serial connector can supply power to the nRF52832. By keeping this jumper to closed, you'll be able to power the nRF52832 with the same device used to program it. You may want to cut the jumper if you're powering the board externally. Also consider opening the jumper if you're using a 3.3V FTDI Basic (the non-"beefy" version), which may not be able to source enough sustained power to supply the chip. One of the nRF52832's most important features is its low-power capability. If your application needs to run for months on a single battery and you're making full-use of the nRF52832's ultra-low power sleep modes, the 1-2mA of current pulled by the LED may relatively dwarf the current draw of the microcontroller. Cutting this jumper will effectively disable the power LED. You won't always have a visible power indicator, but you'll be able to save a lot of power! One of the most unique features of the nRF52832 is its NFC tag support -- it can transmit data to a nearby NFC-compatible device, or even be programmed to wake-from-sleep in the presence of an NFC field. To use the NFC feature, a 13.56 MHz antenna must be connected to GPIO pins 9 and 10. 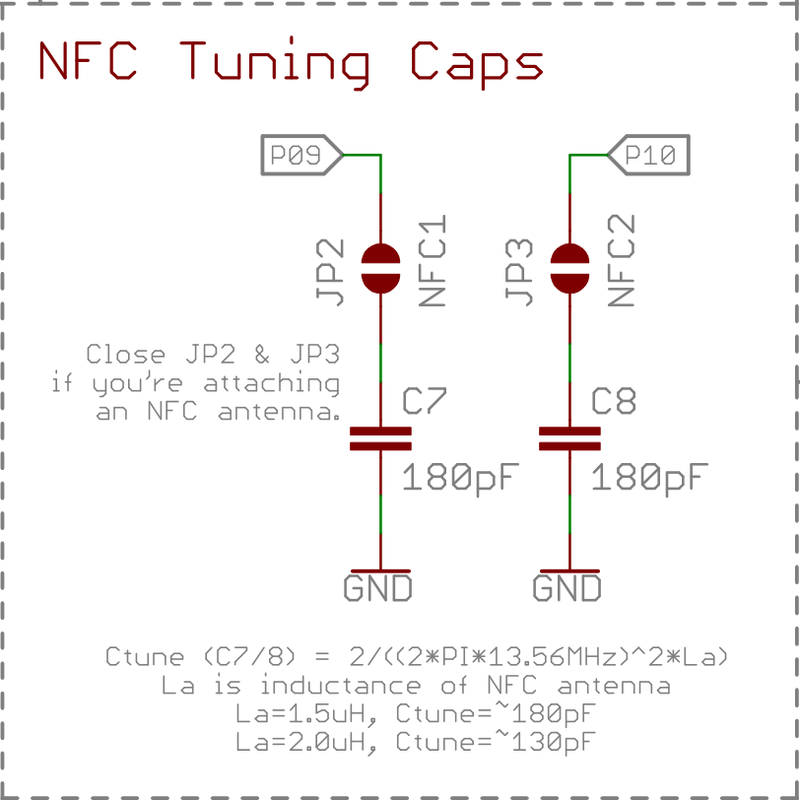 Most NFC antennae also require a pair of tuning capacitors between the antenna pins and ground. The NFC jumpers can be closed to connect each of the NFC antenna pins to a 180pF capacitor. 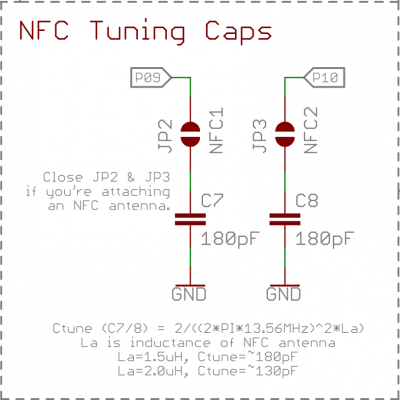 NFC tuning caps and enable jumpers, from the nRF52832 Breakout schematic. This cap value may not be perfect for every antenna, but it should support a relatively wide range of antenna inductances. We tested it successfully with an Abracon ANFACA-4545-A01 and a Pulse Electronics W7001. The nRF52832 Breakout equips the chip with a 32.768kHz crystal -- connected to GPIO pins 0 and 1. Unfortunately, those pins make up a quarter of the available ADC inputs. So, if your application doesn't require an RTC -- and you need those pins to for another purpose -- grab a hobby knife and cut the two traces between their pads to disconnect the crystal. To program the chip, and to use any of the nRF52832's 32 I/O, you'll need to solder something to its headers. In the least, we recommend soldering right-angle male headers or straight male headers onto the six-pin serial header. Either of these will interface easily with the FTDI Basic and Beefy Breakouts. Solder a six-pin right-angle header into the serial port to interface it with an FTDI Beefy 3. The remaining two rows of vias are breadboard-compatible, so you can solder male pins into both and have it straddle a breadboard. Solder straight male headers into the pair of header rows to make the breakout breadboard-compatible. Or you can solder wire, female headers, or anything else your project requires into those remaining holes. 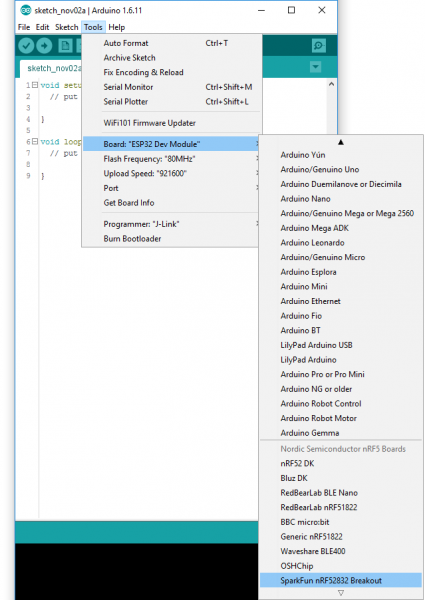 Arduino isn't the most powerful IDE out there, nor is it the most versatile, but it does make things easy if you're just getting started with a new platform. Fortunately, there's an nRF52 Arduino board addon available for just that purpose! 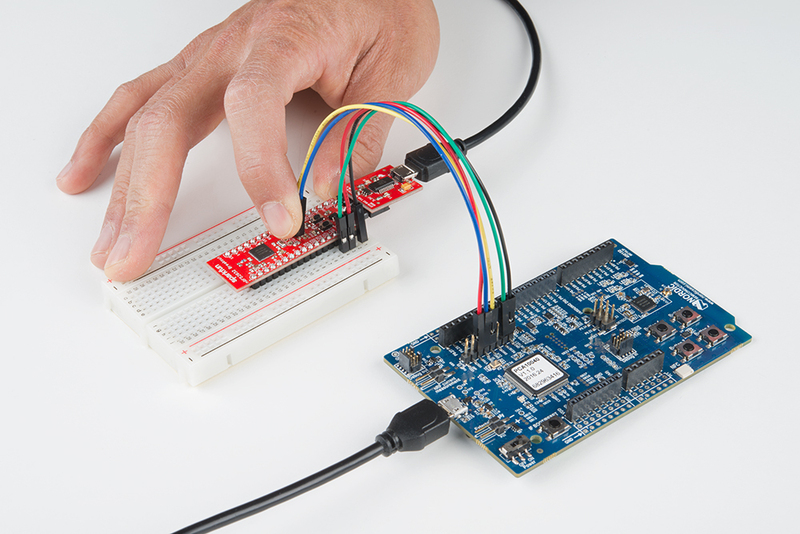 This section details how to install the nRF52 Arduino libraries, cores, and tools. The nRF52 Arduino cores are based on the great work by sandeepmistry. We've added nRF52832 Breakout Board compatibility to his board files, and added an extra tool to enable serial bootloading. To install support for the nRF52 board in Arduino, begin by opening your Arduino preferences (File > Preferences). Then copy and paste the URL below into the "Additional Board Manager URLs" text box. Then hit OK, and navigate to the Tools > Board > Boards Manager... tool. 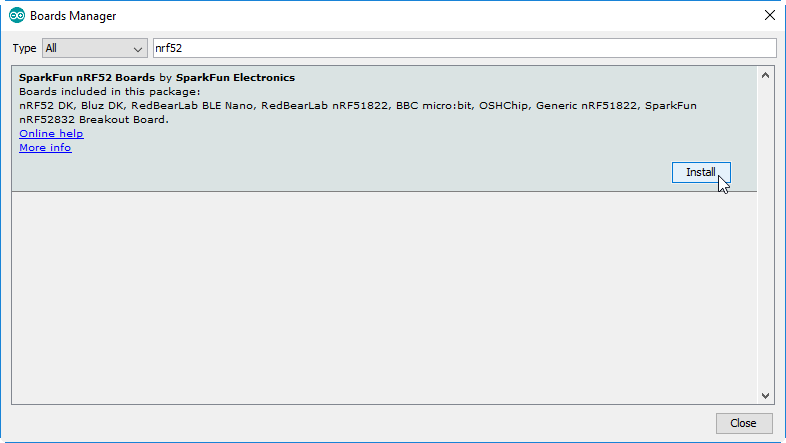 A search for "nRF52" should turn up a SparkFun nRF52 Boards result. Select that and click install. The install may take a few minutes -- the package includes arm-gcc and a few other tools totaling around 100 MB. 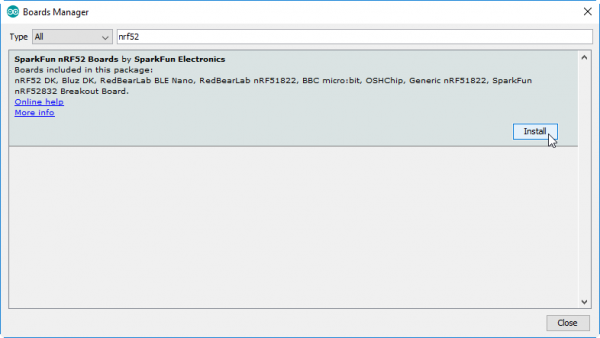 Once the installation is complete, go to Tools > Board and select "SparkFun nRF52832 Breakout" under the "Nordic Semiconductor nRF5 Boards" section. The nRF52832 Breakout ships out with a pre-programmed serial bootloader, so you don't need a specialized JTAG programmer to load code onto it. You do, however, need an FTDI Basic (or an FTDI Basic -like device) to set up a serial interface between your computer and the breakout. The FTDI Basic mates up with the nRF52832's 6-pin serial header. Match up the "BLK" and "GRN" labels, and slide the boards together. You should see the red power LED illuminate. If it doesn't power up, make sure you haven't disabled the FTDI-VCC EN jumper on the back of the board. Press down on both the RESET and 06 buttons. Verify that the blue (pin 7) LED begins blinking. Release the 06-labeled user button. While in bootloader mode, the nRF52832's blue LED on pin 7 should blink at increasing speed in what we call the "timebomb" sequence. This is, admittedly, a little tricky and a lot annoying to perform before every program, but it's the trade-off we get for not programming via expensive JTAG programmers. Once you've entered the bootloader, you can upload code to the chip via Arduino's "Upload" button. LED Polarity – The blue LED, attached to pin 7, is active-low. Writing the pin LOW will turn the LED on, and writing it HIGH will turn it off. Failed to upgrade target. Error is: No data received on serial port. Not able to proceed. - bootloader, SoftDevice or application on target does not match the requirements in the DFU package. - baud rate or flow control is not the same as in the target bootloader. - target is not in DFU mode. If using the SDK examples, press Button 4 and RESET and release both to enter DFU mode. Make sure your nRF52832 Breakout's LED is blinking in a ticking-timebomb pattern -- ensuring that it's in bootloader mode. If the chip is in the bootloader and still not accepting code, try cycling power to the breakout by disconnecting and reconnecting the FTDI Basic. The nRF5 board definitions will allow you to program the nRF52832 and toggle its GPIO, but it doesn't include any Bluetooth support. For that, we recommend grabbing the BLEPeripheral Arduino library. 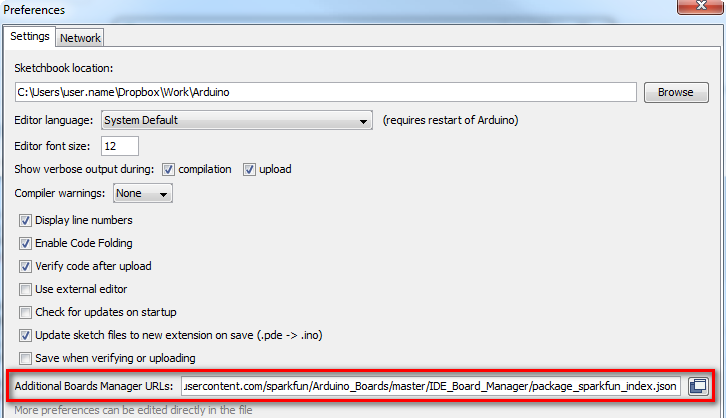 The BLEPeripheral library can be installed from Arduino's Library Manager. Simply go to Sketch > Include Library > Manage Libraries.... In the search box, type "BLEPeripheral", select it, and click "Install." Alternatively, the library can be installed by downloading the latest version from the GitHub repository. Follow along with our Installing an Arduino Library tutorial for help installing the library via this method. Here are a few examples that show as bare-bones as possible what it takes to turn your nRF52832 Breakout into a BLE peripheral. 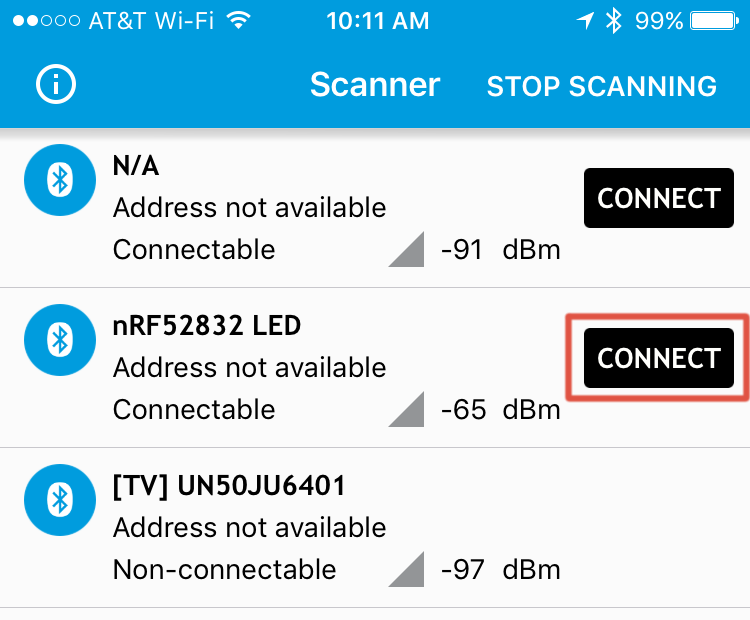 This first example allows you to control the board's pin 7 LED from your smart phone -- using the nRF Connect app. It's the Blink sketch of the BLE world! To test the Bluetooth connection, you’ll need to pair the breakout board with another Bluetooth-compatible device. Most modern smartphones can fit that bill. 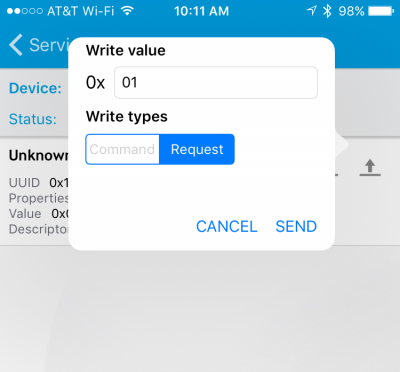 You'll also need a BLE application installed on your phone – something that lets you connect to devices and fiddle with or read their characteristics. 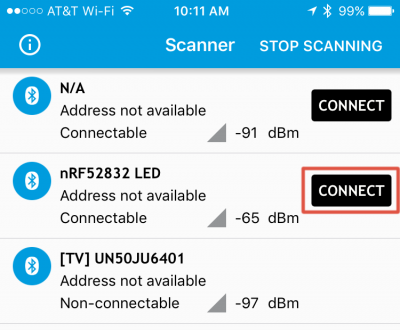 There are a handful of Bluetooth debugging applications out there that can help get you started communicating via Bluetooth. PunchThrough’s LightBlue Explorer is one of our favorite’s, but it’s only available for iOS. Nordic’s nRF Connect – available for both iOS and Android devices – is another good choice. That’s what we’ll document here. Copy and paste the code below into your Arduino IDE. Then upload the code to your Breakout, using the instructions from the previous section. You can set the device name -- replacing "nRF52832 LED" -- with the blePeripheral.setDeviceName([name]) function. Click "Connect" on the nRF52832 LED device, and you'll be sent over to the "Services" view. From there, click "Unknown Service" -- the UUID string should match that of the bleServ object in your example code. This next interface takes some experimenting to figure out. The down arrows represent reads, the up arrows allow you to write to a characteristic, and the triple-down-arrow turns notify on or off. To begin, tap the up arrow next to the top "unknown service". This will allow you to control the state of the LED. In the box that opens up, try entering either 00 or 01, which should turn the LED either off or on, respectively. After tapping "Send" you should see the LED change state. This example demonstrates how to use the BLE read and notify features. It monitors the button on pin 6 of the nRF52832 Breakout. When the button state changes a BLE notification is sent. Use nRF Connect to connect to your nRF52832 Breakout -- just like last time. This time the name of the device should change to nRF52832 Button (if it's still "LED", try connecting anyway -- sometimes the local ID doesn't change until you've connected to it). Tap into the "Unknown Service" again, but, this time, try tapping the single-down arrow to read the service's characteristic. This will read the state of the nRF52832 Breakout's pin 6 button. While the button is un-actuated, the value of the property should be 0x01. If you can hold the button down while also tapping the single-down arrow, the value should change to 0x00. Activate notify by tapping the triple-down-arrow. Then when you press the button, the value should automatically update. You can also try setting the characteristic to notify, by tapping the triple-down arrow. In this mode, the value should automatically be notified when there's a change in state. Press and release the button to see the value change from 0x00 to 0x01. There are loads of resources available to you as you continue on in your nRF52832 development. The nRF52832 Breakout is open-source hardware. Feel free to browse our EAGLE design files, download schematics and follow the products lifecycle on our GitHub repository. For more on the nRF52832, your first visit should be to the "Documentation" and "Downloads" tabs of Nordic's nRF52832 Product Page. There you'll find loads of datasheets, user manuals, and software tools. If you feel hamstrung by the bootloader and want to begin JTAG'ing and debugging the nRF52832 with a more robust tool, consider grabbing the nRF52832 Hardware Development Kit. You can even use it to program the nRF52832 via the SWD protocol. Warning: Just like any Arduino with an Atmel microcontroller, the factory bootloader will be erased from the nRF52832 when reprogramming it with the hardware development kit. You will need to reflash the .hex files located in the GitHub repository: nRF52832_Breakout>Firmware>bootloader-custom. Locate the SWD header on the nRF52832 Hardware Development Kit and SWD pins for the nRF52832 breakout board. Using 5x M/F premium jumper wires and a breadboard, make the connections listed in the table below. 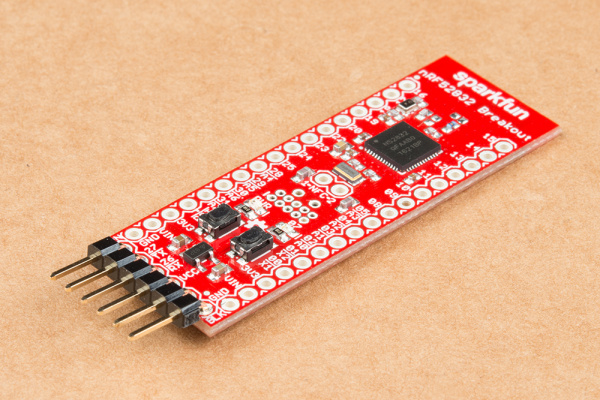 Vdd nRF, VDD, and the SWO do not need to be connected when programming the target nRF52832 breakout board. 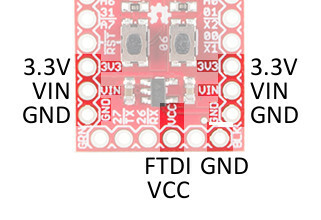 You can also use the other 3V3 or GND pins located around the nRF52832 breakout board. The nRF52832's single-wire debug -- SWD -- pins are broken out to test points near the NFC antenna pads -- labeled "C" and "D" for SWDCLK and SWDIO, respectively. The SWD test points are not using standard through hole sizes so a standard male break away header will not fit. Cutting a 2-pin header from the female header will fit but can block the some of the 2x5 header. Add the SparkFun Beefy 3 FTDI to the RF52832 breakout board's FTDI header. 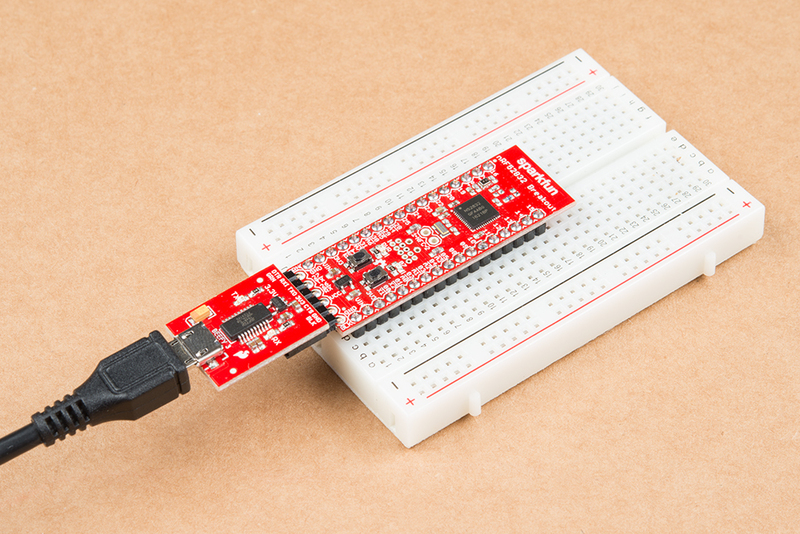 Connect a micro-B USB cable nRF52832 Hardware Development Kit and another micro-B cable to the target nRF52832 Breakout Board. While programming the target, make sure the jumper wire pins have contact with pins D and C by lightly pushing the jumper wire pins against the through holes. You could also solder the jumper wire pins for a more secure connection. For faster programming, the nRF52832 Development Kit can be used to program the nRF52832 Breakout Board. The pair of Arduino examples in this tutorial barely scratch the surface of the nRF52832 and the BLEPeripheral library's capabilities. For more on the BLEPeripheral library, we recommend checking out the included examples, under the File > Examples > BLEPeripheral menu in Arduino. When you begin creating BLEPeripheral sketches of your own, we recommend checking out the library's API. The nRF5 SDK -- Nordic's software development kit for the nRF51 and nRF52 series chips -- is an amazing suite of software and example applications. All you need to set the toolchain up is ARMGCC (the SDK also supports Keil and IAR, if you've already shelled out for those options). The SDK is rife with examples which demonstrate all of the nRF52832's BLE capabilities, plus ANT, NFC, and all of the chip's hardware peripheral features.